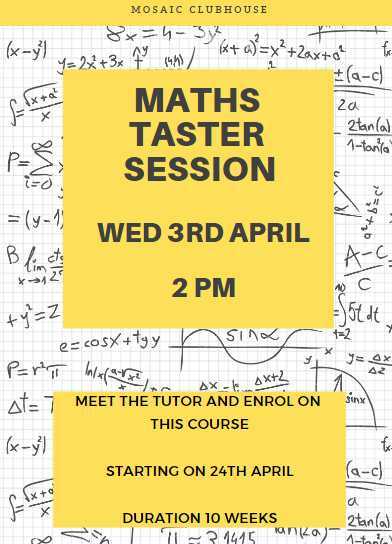 Come and join us on Wednesday 3rd April at 2pm for a Maths Taster session where you can meet the tutor and enrol for the new course starting on Wednesday 24th April, 12.45 – 14.45 for 10 weeks. This course is all about helping you to feel more confident with basic math skills. Both these courses are open to all Lambeth residents, you do not need to be a member at Mosaic Clubhouse. Both courses will be free if you are receiving benefits.